Can't Believe We Ate... | Eating is more than a necessity…it's an adventure! I love Thai Foodie…. She has a recipe for Peanut Sauce (Legit, no less!) that makes a much larger quantity than I was prepared for…. Since I bought Jif “natural” and didn’t check for added sugar until AFTER I tasted the sauce and realized it was WAY too sweet…. I ended up adding an extra 2-3 tablespoons tamarind and a couple tablespoons of fish sauce, as well as using the full 2 tablespoons of red curry paste to offset the “too sweet” aspect. Success!! I have about 2 tablespoons of the ACF peanut sauce left in the fridge….and I’ve got close to a QUART of fresh peanut sauce… They taste slightly different…. The ACF sauce uses lime juice for the “sour” component and Thai-Foodie uses tamarind. Both are in keeping with Thai cuisine, so both are “authentic.” One thing I’m sure of at this point is I need to find a few things peanut sauce works with so we can enjoy our labors! I got a copy of The Original Thai Cookbook (by Jennifer Brennan) for Christmas. I’m starting to wonder what region of Thailand the recipes come from. The Peanut Sauce is ok…just not what we think of when we think of Thai Peanut sauce. It’s super thick – spreadable thick…and lacks a sour quality. The ingredients are red curry paste, coconut milk, peanut butter, palm sugar and fish sauce. Like I said…really thick… I ended up adding palm sugar (even though the peanut butter had sugar in it…same peanut butter as I used above….some soy, more fish sauce, the juice of half a lime AND 1/2 cup of water. It was still thick…and neither of us like it as much as either of the previous sauces we tried. And so…on to the next! I’ve just about decided that Salad Rolls, aka Spring Rolls are as different as each preparer, just like American potato salad is different from one kitchen to another. One recipe calls for green onions, another for soaked red onions. Sometimes they included bean sprouts raw, another recipe called for blanched, and another doesn’t include them at all. My recipe comes from a little bit of this, a little bit of that… Sounds like Golda in Fiddler on the Roof, but that’s how it’s done. Blending the flavors until there’s a harmonious blend of sweet, salty, spicy and sour. I know when I’m really close because the flavors become indescribable. Mix your dipping sauces and set aside. I made the peanut sauce, sweet chili sauce, and nuoc cham…a simple Vietnamese sauce of lime, fish sauce, water, sugar, garlic and garnished with a few slices of Thai Bird Chiles. I cooked my shrimp in a hot skillet while they were still in the shell. There’s more flavor and the shell helps keep the shrimp from over cooking. When they were done, off to an ice water bath. I set the pan aside with the shrimp browned bits for cooking the bean threads. Bean threads need to soak in hot water for up to 30 minutes, then cook them quickly in just a bit of water until they are translucent. Rinse in cold water to stop the cooking process and cool the noodles so you can handle them. Using kitchen shears, cut the threads to 2 inch lengths. It makes it a lot easier to fill the rolls. Toss in all the rest of the vegetation, mix and prepare to fill your rice paper wraps. Rice paper wraps can be tricky, but if you watch out for a few key things you should be ok. The rice wraps need to be dipped completely in shallow water as hot as you can stand. They need to soak just a few seconds, then transferred to a damp towel before they start to give up their shape. They’ll continue to become pliable. For 6 inch round rice papers, you’ll need about 3 Tbsp. of the shrimp-bean thread mixture placed at home plate. Roll away from you to 2nd base, but stop at the pitcher’s mound. Fold 1st base in…fold 3rd base in, then roll the whole thing from pitcher’s mound out to center field. I put just a tiny bit of oil on my plate, and load up the plate with little rice paper “burritos”. I had 12 rolls from what I put together. It would have been nice to have these with a small bowl of soup… We’ll see…when I learn how to make decent sized portions! 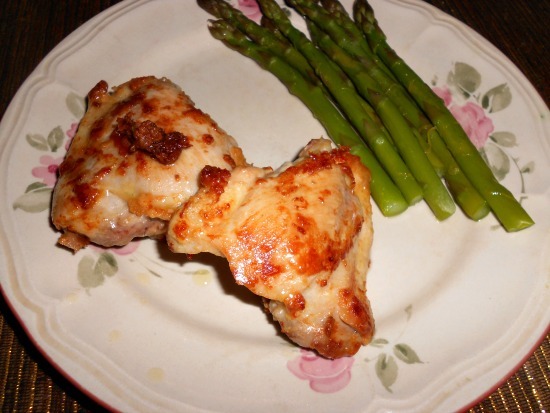 This recipe comes from the American Culinary Federation. It’s a keeper. Not sweet, not hot…not too spicy. I just couldn’t seem to pull myself together to get out of the house tonight. I wasn’t sure what I was going to do about the evening repast, but I was holding my options open for take out. The trouble with take out is…it’s still the local food. Now…some of the local food is good, but nothing is AMAZING… That’s what’s driven me to cook all the while we’ve lived here. Tonight didn’t work out a lot differently. I’ve been trying to pull a menu together for next week…we’re going to be busier than usual for a few weeks. I have a magnetic calendar on the front of the fridge…and as I walked past, the words “Thai Omelets” jumped off the page at me. I pulled up the recipe from Thai-Foodie, and found I had everything either in the fridge or the garden. Yes!! This is one of those, whatever you have on hand recipes. The base recipe is eggs, fish sauce, a dribble of sweet soy, and a bitty dusting of (Thai) white pepper. Start the pan (wok) with oil and get it screaming hot…smoking just a little bit…stir in the garlic & green onion, then pour in the beaten, seasoned eggs and cook until the edges are well set, then turn the whole thing (use 2 spatulas). Serve over mounds of steamed rice. It’s really easy. My version went something like this… Since I had fresh mushrooms, I sauteed those before anything else…then cooked a stick of Vietnamese sausage – tasty stuff, but I wasn’t expecting the unique flavors in my sausage. I made a chiffonade of swiss chard fresh from the garden, and we were ready to go. I started the garlic and green onions, then added the sauteed mushrooms, followed by the strips of chard. As soon as those items were nicely cooked, I poured in the eggs (the eggs also had a squeeze of fresh lime in the mix). You have to play your heat just a little to get it done all the way around without scorching it, but it cooks pretty quickly. The flip wasn’t as hard as it sounds. I cut ours in 2 pieces, one for each of us and served it with chile-garlic paste (Sambal) and soy on the side. The cooking method and tastes aren’t quite like what we think of as an omelet…but like with the sausage, there’s flavors in their we just aren’t anticipating! I confess…I was anticipating a bit of fire, but I wasn’t expecting the sweet & sour. In fact…it was a good thing I cooked the sausage in a separate pan…the sugar cooked out a little and caramelized all over. Sticky! But tasty! I’m currently on a serious Thai food kick. I can’t seem to get enough of the salty-hot-sweet-sour flavors. I have not less than 4 Thai specific cookbooks, but a couple bloggers caught my eye with the simplicity, and their recipes! Oh my!! First…there’s Leela of She Simmers. She’s the real-deal…all the explanation to go with it. I get intimidated, but I go there anyway!! Then…my newest muse, Sherri of Thai-Foodie. I love the love story…I love how she loves her family, especially her kids, and I love that she shares authentic Thai recipes in laid back English. Thank you, Ladies!! I’ve learned so much from you!! Today’s recipe find is Sherri’s Thai Turkey Burger Sliders. I followed her recipe almost exactly…. I did this so I could remember what I did…. I cooked a small piece to check for seasonings…. This is going to be AWFUL…ly good. I’m going to make a cabbage slaw with Papaya salad seasonings to go onto the sliders with that Sriracha Mayo. Oh my, The slaw will provide that sour punch that nothing else has in it. I’ll save that recipe here later. I didn’t make the Sriracha Mayo quite as hot as Sherri did…. I used 1/2 cup mayo with 3 Tbsp of sriracha. I didn’t want too much fire on the rolls, because I made a slaw that had a kick going on for them as well. I’m calling it Som Tum Slaw…simply because it’s a cabbage slaw, but with Papaya Salad dressing and seasonings…. And it worked really well on the sliders! Dressing- Pound together in a mortar with pestle…. When dressing ingredients are thoroughly smashed and form a wet paste, add the cabbage and pound 3-4 times, stir, then add more cabbage until all has been lightly pounded. I also added a few halved tiny tomatoes to the mix. Refrigerate 30 minutes to allow the flavors to blend. Spoon 1-2 Tbsp of slaw on top of turkey burger just before serving. I got just over 6 slider sized patties out of the mix above…make them a little smaller and get 8 instead. Two is enough for an adult serving…we did 3 and it was a little too much. The flavors went together amazingly!! Kind of a Thai fusion turkey burger…all the Thai flavors – sweet, sour, salty, and hot – all on small bakery buns, butter toasted and slathered with the Thai Sriracha Mayo….then the Som Tum Slaw! The slaw adds a little acid, a little fresh crunch and a little more fire. So good! I’m always disappointed when I don’t have time to cook with this group…the ladies are wonderful, and there’s no pressure. I get even more disappointed when my selected recipe comes and goes and I don’t get to play!! Pork bahn mi sandwiches were scheduled for April 9th….it’s now the 29th. Wow, how time flies!! A bahn mi is a Vietnamese sandwich filled with grilled meat, cilantro, pickled veggies and crisp cucumber. I hiked to The Wooly Pig Cafe in San Francisco to try a bahn mi…. The sandwich was well worth the hike, but SF is 150 miles away so I can’t do that as often as I’d like bahn mi! Time was against me, so I cooked, and didn’t take pictures this time. I used a softer whole wheat roll rather than the crisp-chewy baguette, and I forgot to buy daikon, so we were “daikon-less.” I didn’t add quite as much sriracha as the recipe called for….I figured there was some in the marinade for the meat, and some on the sandwich…and I don’t have an asbestos tongue. Even with the minor adjustments, the sandwiches came out great. The pork was done just right to be tender and succulent, and with those seasonings and pickled veggies….oh yum!! All the flavors I was hoping for were there…a little heat, a little cool cucumber to offset it… Sheer pleasure! 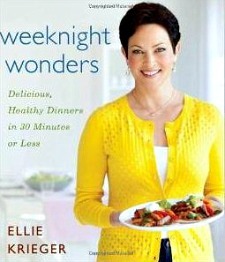 I hope the other ladies enjoyed this recipe from Ellie’s Weeknight Wonders cookbook. It truly was easy to put together too….after a full workday and a weed-eater session!! Oh….by the way, the next time I get to venture to The Wooly Pig Cafe….I’m having “The Wooly Pig”!! I’m so far behind in posting and cooking that I’ve stopped thinking I’ll “catch up”. I’ll have to settle for posting what I’ve cooked and cooking what calls loudest to me for now. It’s a challenge to work full time and volunteer semi-full time and still COOK at all some weeks! A couple concerts and a children’s musical stage play will certainly rearrange your life! Next up was the Parmesan crusted chicken… This tasted far better than it looks. I lost a lot of the Parmesan crust when I turned the chicken. Doggone it. Still….darn quick to put together and very tasty. Sometimes the entrees go together so quickly the sides need to be started first!! 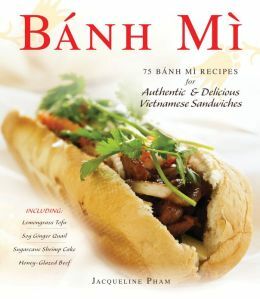 I’m about caught up on rest and ready to jump back into the kitchen…maybe I can even get my dish done ahead…we like Bahn mi!! We’ll see…. Easter does need to sneak in here somewhere! 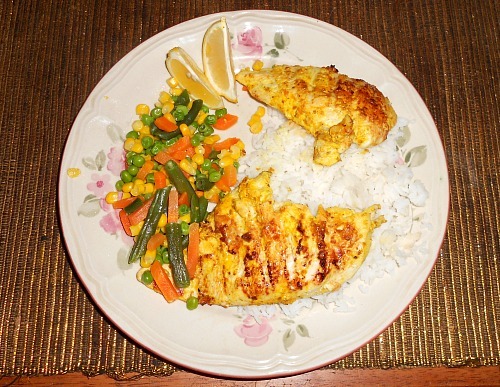 Ellie’s Grilled Tandoori Chicken Breasts, pg. 137 of Weeknight Wonders, was my selection for the week of Feb. 26th. What an easy dish to put together….they all are, if you have all the ingredients!! A few spices mixed into yogurt and smeared onto the chicken for a brief marination period, then off to the grill….or in my case…the grill pan!! I owe my sister cooks an apology for this one… The US was hit with almost coast to coast bitter cold and snow, north to south, so grilling was a challenge at best. Only a California gal could think of “grilling” as a year ’round activity! I’m sorry! If it’s any consolation, by the time I had a moment to put this recipe together, we were having incredible thunderstorms and downpours. I was glad for my grill pan…. We enjoyed this dish quite a lot. I served the chicken with a simple steamed mixed veg on the side and steamed basmati rice underneath. I’m looking forward to the next chicken dish as well! 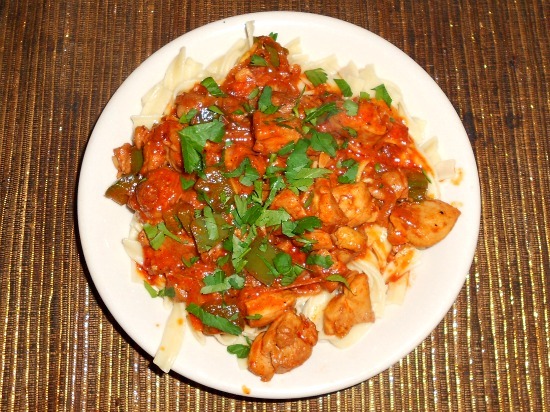 Chicken Paprikash is up next! If you’d like to cook along with us, please visit Eating With Ellie….